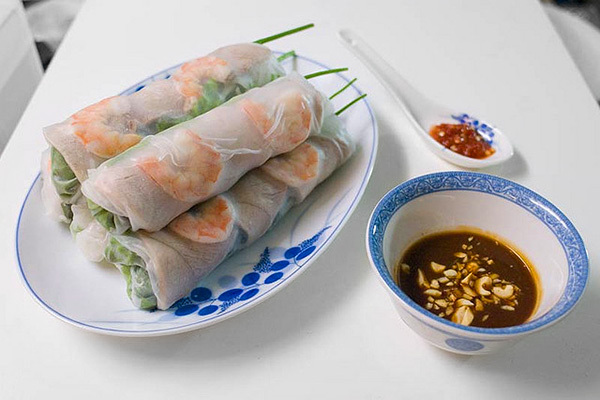 Bánh giò is a originally a steamed street snack from Northern Vietnam. 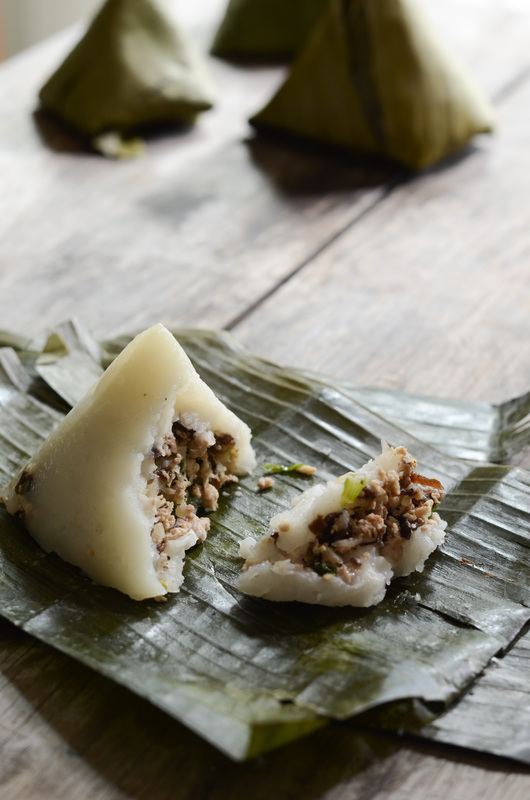 It’s a small, savory snack great any time of the day, made with a rice flour outer layer, ground pork, mushroom and onion filling and all with a special aroma from a banana leaf wrapper. I learned this recipe and technique from my Mom many years ago. More steps are involved in this recipe, but they’re pretty simple to follow. 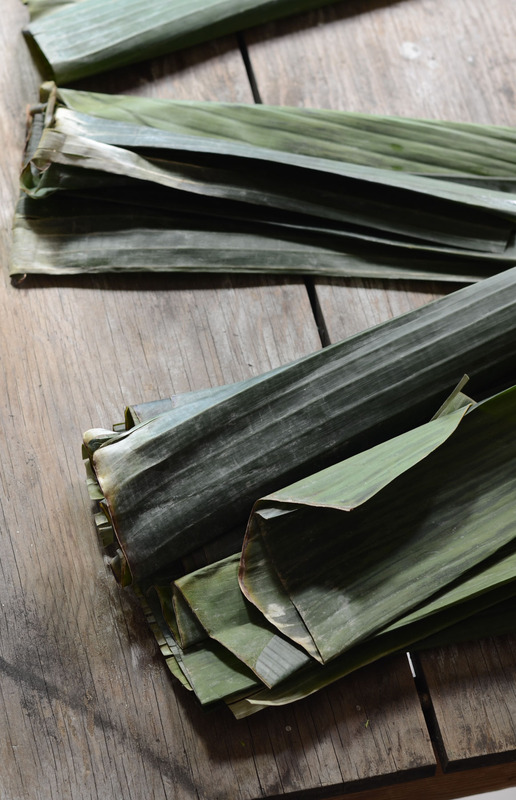 These are best made in larger batches due to the atypical usage of banana leaf and a large steamer, but are well worth the effort! Bánh giò was originally cheap street food, so it’s not really something restaurants easily profit from. These originate from Northern Vietnam, and my mom remembers them like many other foods there: it contained very little meat which would have It was very modest but delicious snack really worth looking forward to. Variations you’ll find in the States nowadays reflect our contrasting food supply. These bánh giò will have a much higher filling to rice ratio, and some even feature quail eggs. What Does Bánh Giò Mean? 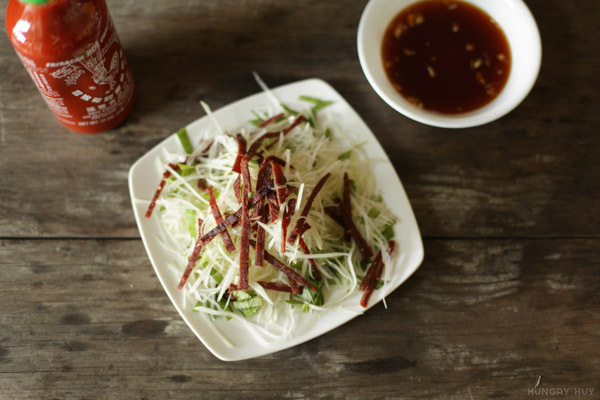 There’s not often a direct translation into English for Vietnamese recipes or dishes. For instance this is sometimes referred to as steamed dumplings. When I think of dumplings I think of ready to eat, bite sized little bites of (usually meat) filling encased in some kind of wrapper. This has an inedible wrapper, but contains filling encased by a flour paste rather than a wrapper–it loosely fits the bill. The literal meaning of bánh giò is “pork cake” which doesn’t exactly translate into the English in an appetizing way. Jicama is pictured here which is not in our recipe. Feel free to substitute meat with jicama at a 1:1 ratio if you want less meat and more crunch texture in the filling. 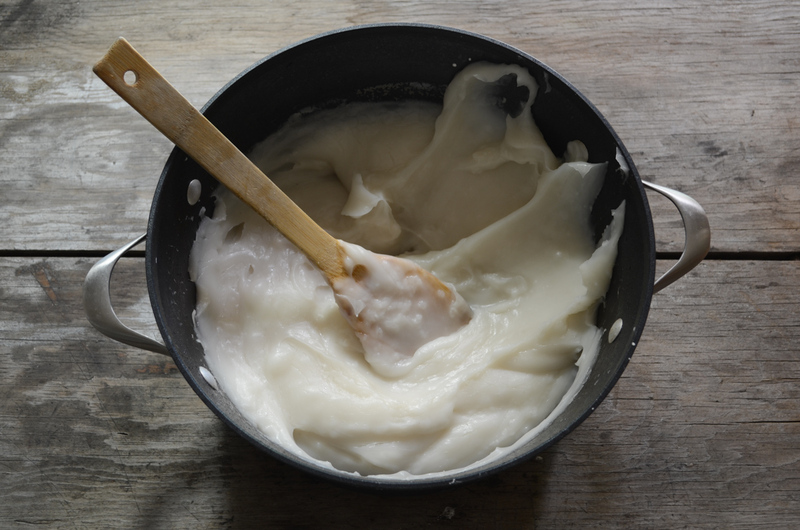 There are very few Vietnamese dishes that feature this kind of rice flour paste mixture. 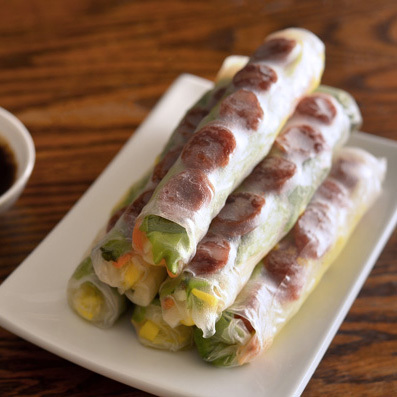 One of which is Hue’s banh nam/banh la. 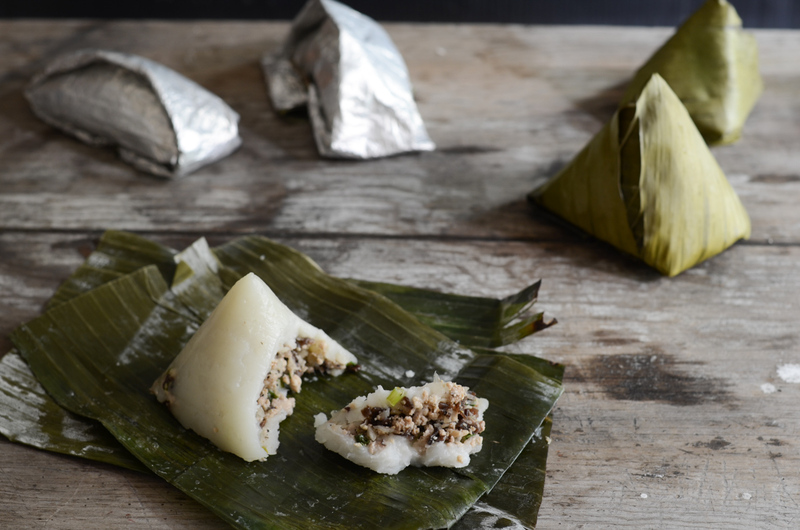 These are flatter cakes an wrapped and steamed in banana leaf. 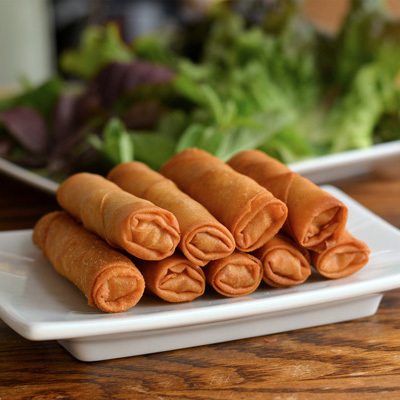 Banh nam uses tapioca flour, rice flour, but zero corn starch, and the filling is made primarily of shrimp instead of pork. 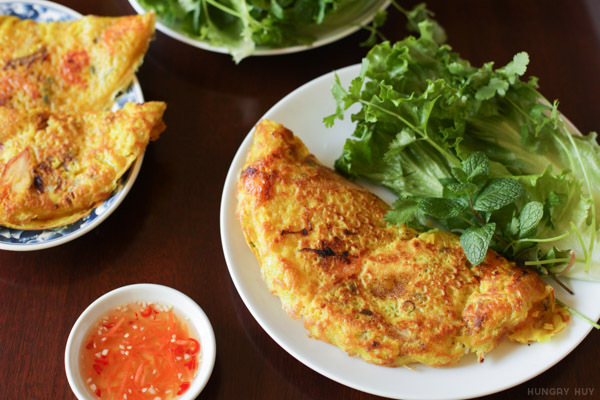 Banh beo is a similar twist on this as well. You may often see the outer layer also wrapped in plastic wrap, or aluminum foil for reinforcement during cooking. But if you’re going to plate this or gift it they look much nicer with the banana leaf layer exposed. Places around here near Little Saigon in Southern California like Đức Hương Giò Chả will sell this, along with many other Northern foods. You can get this at quick takeout shops like the Bánh Mì Chè Cali chain of stores, or even at counters at Vietnamese supermarkets. To goal here is to impart flavor and aroma into the rice flour layer, and make it look good. We also want to make sure this dumpling stays together during cooking and doesn’t drip all over your steamer. The inner wrapper is banana leaf which varies in quantity, but you’ll typically see variations for the second outer layer. I typically people using either a plastic wrap or aluminum foil. 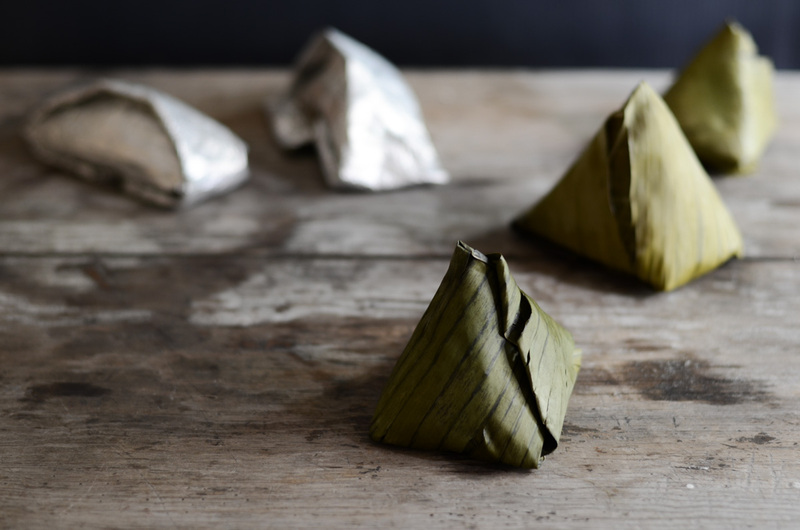 This inner wrapper is banana leaf since it adds flavor to the rice flour, aroma and visual appeal. One layer isn’t enough to safely keep the dumpling together during cooking, so you can add a few more layers of leaves to reinforce. 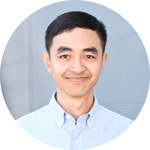 In Vietnam only leaves were used since they were so cheap and readily available, but the same does not hold true here..
For stability with an outer layer, instead of using more leaves you can use aluminum foil as a cheaper alternative. Some shops will use plastic wrap as their outer layer because it’s even cheaper. However, I try to avoid heating up plastic that makes contact with food for health reasons. Since foil is pretty cheap, let’s go with that. To prep the banana leaves, scrub them under running water, dip them one at a time into a pot of hot or boiling water to slightly soften them, then drain in a basket. The boiling cooks the leaves a bit so its easier to wrap, and so its less likely to tear when you cut it to size for wrapping. You can do this in advance the day before if needed, but this step is mainly to clean the leaves and trim out the leaf stem/ribs since they are tough to fold. Making the rice flour mixture is pretty simple, however there is some estimation you’ll need to do. The above photo shows the final consistency of the flour mixture you want, but you may have to adjust timing based on the pot you use, the power of your stove, the temperature of the water you use, etc. But the main goal of heating this mixture is to incorporate the ingredients and par-cook the flour so it reaches a consistency that’s thin enough to remain easily spreadable but thick enough so that it can support the filling inside, and doesn’t spill everywhere while you try to wrap the dumplings up. The traditional and more common shape for bánh giò are pyramids. It takes a little bit of practice to master but I think they look a little fancier and more enticing to eat. Any wrapping shape is fine though in terms of cooking or serving. The pyramid is a little more complicated, but fun if you’re into that crafting kinda stuff. You can do little rectangular packets (like the two in first photo of this post). There are molds for this if you need assistance getting a proper shape. Here’s a photo of some molds my uncle brought back from Vietnam. 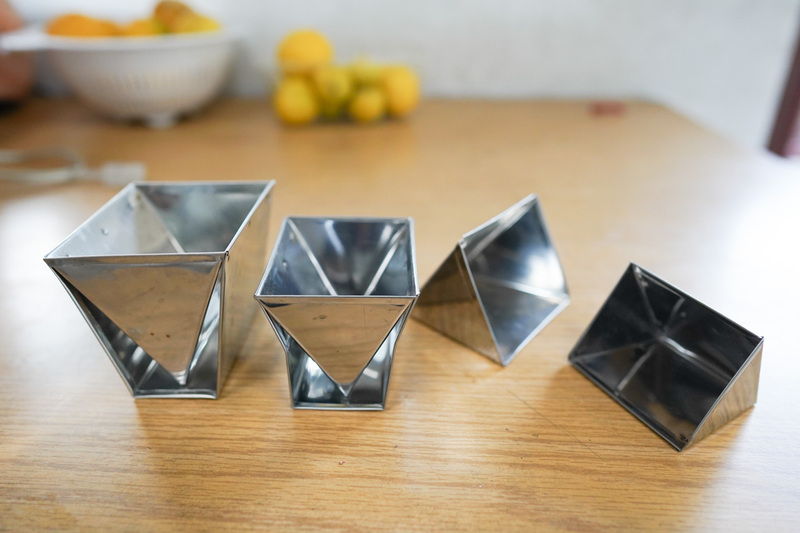 These are triangular looking ones–not quite a pyramid. But there are versions with and without a base if you’re into that. Aand again here’s what they look like wrapped by hand after being steamed and ready to eat! Here, my mom shows us one of her methods for wrapping pyramid shaped bánh giò. This example doesn’t have foil in the initial steps for the outer layer which you can do if you’d like. Note there is no spoken audio! One of my aunts is also known to forgo the wrapping entirely and just assemble these into heat safe bowls and put them directly into a steamer to cook. You won’t get the banana flower aroma, but it’s much easier and it works well! Defrost the leaves if frozen. Wash banana leaves under running water to clean. 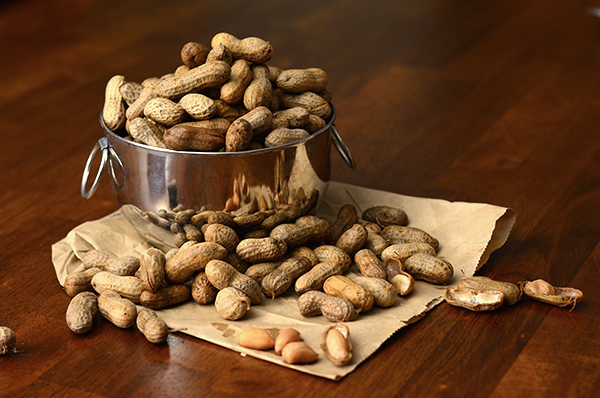 A few at a time, dip into a pot of boiling water for a few seconds to soften. Cut into ~12x12 inch squares, depending on the size dumplings you want, removing tough areas around the stem that are hard to fold. Set aside to dry before use. Mix all ingredients in a large nonstick pot. Rest for 30-60 minutes (longer is better). Turn the stove to high heat until it hits a boil, then lower to medium-high so it maintains a low boil. After it hits the initial boil it should take about 3-6 minutes to thicken. Times may vary. You want it thick enough so the filling doesn't fall through it, but thin enough that you can still easily fill the wrappers' corners with it. Turn off the stove and continue to stir for about 3 more minutes to smooth out the mixture. Dice onion or or roughly chop in food processor. Remove. Roughly chop mushroom by hand or in food processor. 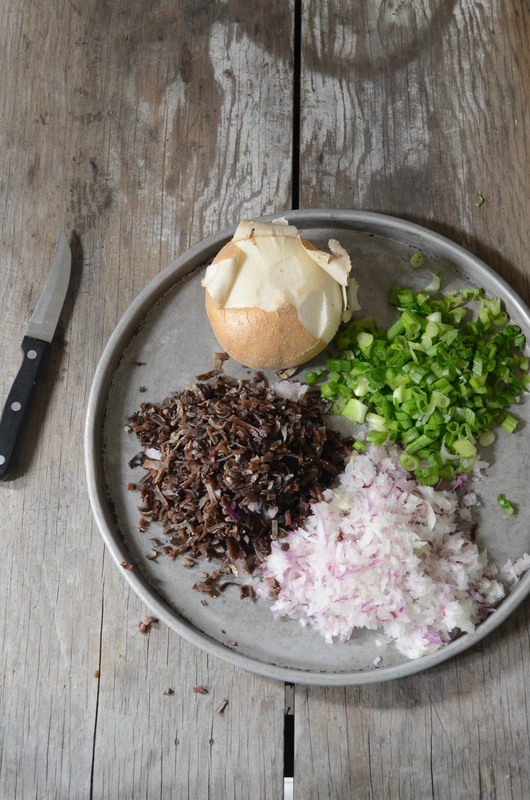 Add oil to a large pan on medium-high, and saute onion light brown and fragrant. Add ground meat and saute until slightly cooked all over, but not fully cooked. Let the meat get tough enough to break apart, and so it's not mushy. Add mushroom and all remaining ingredients to the pan and saute so the mushroom is slightly cooked. After the meat is fully cooked and no longer pink in the middle, taste and add more salt or pepper if needed, to taste. Add a spoonful of the rice flour mixture--half the amount you want in this piece. Add a spoonful of the filling to the center. Add a spoonful of the rice flour mixture to encase the filling. Finish wrapping, repeat until you use up all your ingredients. The goal is to evenly split the rice flour mixture and filling for each pyramid into 12-14 equal portions. Add ~2 gallons of water to a big steamer pot. Add all the banh gio to the steamer rack. Cook for about 40 minutes. At about the 40 minute mark, open one up and check the rice flour mixture for doneness. When it's clear it's done. Add more steam time as needed--it's difficult to overcook this.